There is no other region with as diverse and as abundant terrestrial mammals as East Africa in the world. Coupled with the beautiful white sand beaches on the Indian Ocean coastline, this region is transformed into a tourists' paradise. The name East Africa is today used to refer to Kenya, Uganda and Tanzania. Of late however, East Africa has expanded to include Rwanda and Burundi. Thus, when talking of East Africa, you will be talking about the members of East African Community (EAC) who includes the 5 countries. East Africa constitutes a Swahili culture with some inflects of United Kingdom (who were the colonial masters of the region). In fact, English is the official language in Kenya, Uganda and Tanzania while Kiswahili is the national language. With over 80 percent of the 130 million residents being Bantus, you can expect a lot of Bantu culture in the countries. The republic of Kenya is at the center of all this countries and is bisected in half by the Equator, thus forming what is popularly known as the 'East African Time'. The region experiences equal days and nights (12 hours for day and 12 hours for the night). It also boasts a warm, tropical climate which makes it ideal for the proliferation of abundant wildlife. There is no other region with as diverse and as abundant terrestrial mammals as East Africa in the world. Coupled with the beautiful white sand beaches on the Indian Ocean coastline, this region is transformed into a tourists' paradise. Below are a couple of things you need to know about East Africa before you travel there. 1. East Africa has a common visa. If you are travelling in any of the country, you just need one visa. 2. Kenya and Tanzania are home to one of the modern wonders of the world - The Wildebeest Migration. 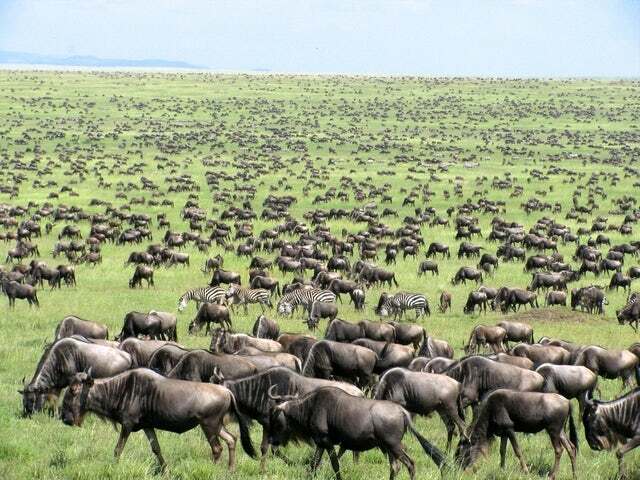 The more than 1 million Wildebeests, 400,000 zebras and more than 300,000 antelopes and gazelles cross the treacherous Mara River in Maasai Mara National Reserve in Kenya to Serengeti National Park in Tanzania in what is seen as the most spectacular terrestrial migration in the world. 3. East Africa is also the cradle of Mankind. In a place called Olduvai Gorge in Tanzania, you will find the archaeological sights that have recorded the oldest known human remains. 4. East Africa is also known as the Great Lakes Region due to the number of world beating Lakes in the region including Lake Victoria, Lake Tanganyika, Lake Nakuru, Lake Naivasha, Lake Baringo and many more. 5. Kiswahili is the most spoken language in Africa and it is the African Union Language. Its roots are in East Africa. 6. Travelling in the region is quite easy. The Jomo Kenyatta International Airport is the regional air transport hub. 7. Apart from good weather, the region boasts beautiful white sand beaches, diverse culture and abundant wildlife. From the Swahili culture and cuisines to the Maasai culture to the Buganda Kingdom, you will be surprised by how much you can find here. 8. The Big Five consisting of Lions, Leopards, Rhinos, Elephants and Buffalos roam freely in the natural habitats. 9. Although bordered in a region full of turmoil, East Africa is perhaps the most peaceful place you can find on earth. 10. Make sure you carry sunscreen lotion, sun glasses, hiking boots, safari wear, beach wear, camping gear, and translation apps for those who can’t speak English, French or Kiswahili. Overall, East Africa is better than all the other touristy regions of the world. It outranks the Caribbean which do not have as diverse wildlife, the Australia which does not have the tropical equatorial climate, Canada and Europe which are have some winter months and other regions of Africa which do not boast as beautiful white sand beaches. Enjoy your trip!